You exit Barn Corner in second gear (80mph) and head towards the start and finish line, which you cross in fourth, before hitting fifth (160mph) as you edge across to the right of the circuit in order to line up Coppice. It’s back down to fourth (140mph) as you sweep round and then you drop back to third (90mph) for the double apex right of Charlie’s. The exit is really important as if you get it wrong you’re going to lose a lot of time along Park Straight. You drive hard out of Charlie’s, all the way up to sixth (180mph) along the straight, moving across to the right as you hit the bottom of the drop. This helps to keep the bike under control before you move back across to the left to line up the entry into Park Corner. It’s down to second gear (70mph) for the right-hander before short shifting through to third for the long right of Chris Curve. Then, again short-shift to fourth (130mph) for the right-left flick of the Gooseneck, before dropping into third (90mph) just as you peel in. After the Gooseneck, it’s the steep downhill drop towards Mansfield where it’s hard on the brakes and back down to second (70mph). The corner tightens up on you as you exit and then you accelerate hard towards the chicane. I go through the right-left, in first gear, as smoothly as possible before accelerating hard to the Mountain section, holding second gear all the way. I keep the power on for the uphill, heavily cambered left corner at the bottom of the Mountain before easing back on the throttle slightly as I change direction for the right in the middle. It’s easy to tuck the front here and then it’s up and over the Mountain, still in second, making sure that you have the jump lined up properly. I stay in second for the right-left-right of Hall Bends where I tend to go over the kerbs on the entry to straight line the corners. Then it’s back down to first (40mph) and hard on the brakes for the right hand Hairpin, the slowest part of the circuit. I’m then back up to second along the short straight before dropping into the final corner, Barn, which can be really greasy if it’s damp as it takes longer to dry out due to all the trees overhead. Then it’s back on the power and the run towards the line. 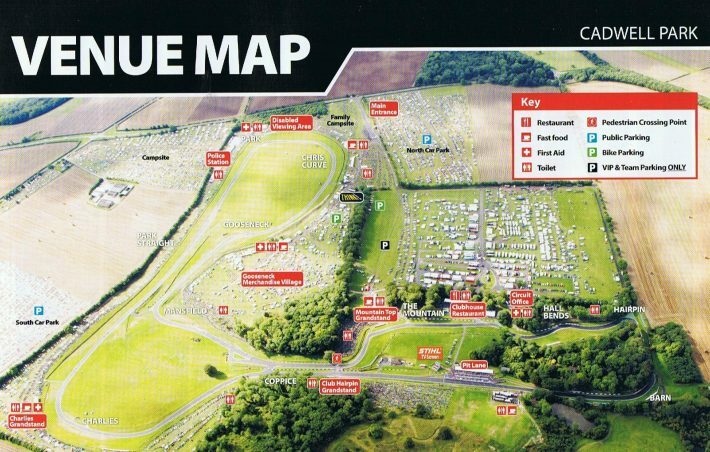 Is Cadwell the best UK circuit? Take your vote now!